tiffany table lamps | Skinner Inc. 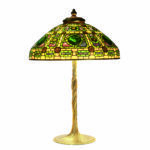 Between 1895 and 1915, a huge variety of mosaic glass lamps came out of New York and Chicago to satisfy a growing demand for stylish lighting designs. While Tiffany Studios set the industry standard, other companies produced excellent designs as well. 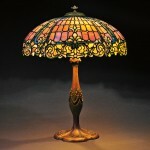 What image do the words “Tiffany lamp” conjure in your mind’s eye? You probably see a colorful, mosaic glass lamp on a patinated bronze base with a floral or geometric motif, or perhaps some dragonflies.